The ASEAN — Russia Summit plenary session is taking place in Sochi to mark the 20th anniversary of the ASEAN — Russia Dialogue Partnership. 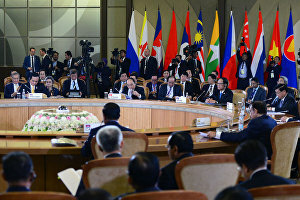 The summit participants adopted the Sochi Declaration titled Moving Towards aStrategic Partnership for Mutual Benefit and approved a Comprehensive Plan of Action to Promote Cooperation Between the Association of Southeast Asian Nations and the Russian Federation in 2016-2020. The Association of Southeast Asian Nations (ASEAN), established in 1967, comprises 10 states: Brunei Darussalam, Cambodia, Indonesia, Laos, Malaysia, Myanmar, the Philippines, Singapore, Thailand and Vietnam. 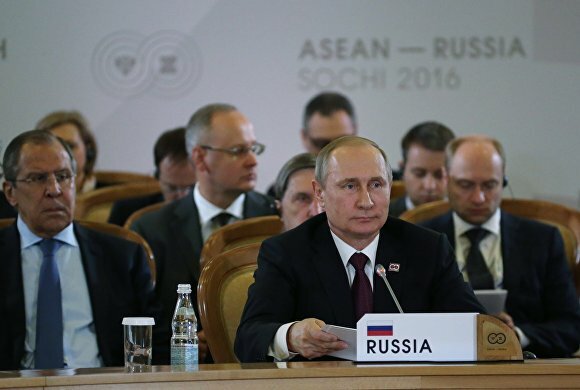 Russia has been a full dialogue partner of ASEAN since July 1996. Today we are reviewing the results of cooperation within the ASEAN — Russia Dialogue Partnership since the previous meeting in this format in Hanoi in October 2010. We will discuss key issues of our cooperation, set new guidelines for the future and share opinions on current issues on the international and regional agenda. The success of this session and of the entire summit are of great importance to Russia. We hope that our work here will be in-depth and productive. I'll now give the floor to our chairman. Mr Sisoulith, please. I am honoured to be a co-chair of the anniversary ASEAN — Russia Summit, dedicated to the 20th anniversary of the dialogue between ASEAN and Russia. Compared to leaders of other ASEAN countries, I have spent very little time in the office of prime minister, just 30 days. This is my first time at this summit in this capacity. I hope that all the esteemed leaders present here will support me. I would like to express my heartfelt gratitude to Mr Putin for his hospitality and the warm welcome extended to my delegation and to me at this summit in the beautiful city of Sochi. Russia is an important partner of ASEAN, and cooperation between Russia and ASEAN is gradually expanding. Russia established relations with ASEAN in 1991, and in 1996 became a full-fledged dialogue partner. We cooperate in the economy, politics and culture, and this cooperation is getting stronger and stronger. Russia's accession to the Treaty of Amity and Cooperation in Southeast Asia in 2004 showed its commitment to cooperation with ASEAN in order to strengthen security in the region and the world at large. Economic, trade, and investment cooperation and personal contacts are also getting stronger, which contributes to the further development of our relations and deeper trust between us. With strong political will on both sides — from Russia and ASEAN — we can further build up our cooperation. We agreed to hold this anniversary summit in order to mark the 20th anniversary of establishing dialogue relations between Russia and ASEAN. This is an important historical milestone, which offers an excellent opportunity for both sides to discuss further steps to strengthen our cooperation on our way to a strategic partnership with a view to establish lasting peace, stability and prosperity of our nations in the future. 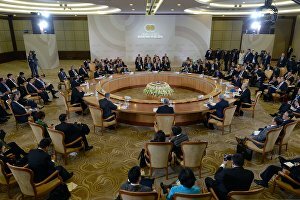 The Lao People's Democratic Republic not only chairs ASEAN, but is also coordinating the 2015-2018 ASEAN — Russia Dialogue Partnership. Laos is proud to have played a role in the development of cooperation between Russia and ASEAN, and to have contributed to drafting final documents of our anniversary summit, in particular, the Sochi Declaration, the Comprehensive Plan for Promoting ASEAN-Russia Cooperation in 2016-2020, as well as the Report of the Eminent Persons Group from Russia and ASEAN, which we plan to adopt today. I am confident that through our efforts this summit will be a success. Thank you. Vladimir Putin: Mr Prime Minister [of Laos, Thongloun Sisoulith], for my part, I would like to thank you for the assistance that you have provided in holding this summit, as well as for your highly unexpected remarks in Russian, which was especially pleasant for the Russian audience. Thank you for this token of thoughtfulness and respect for our country. Ladies and gentlemen, I believe we all understand the kind of world we live in; we understand the state of the global economy; we know about the status of our own economies and there is a reason why we are addressing global and regional security problems. Many countries in the region have been confronted with manifestations of extremism and terrorism and have suffered as a result. Therefore, all of this is on our radar. At the same time, I do not think we expected any unusual breakthroughs or revolutionary ideas from our meeting today. Nevertheless, I believe the meeting has been important and timely. We have reviewed the progress made during 20 years of our cooperation and indeed tried to glimpse toward the future. In this sense, I believe our meeting as a whole has been very useful, and in particular, our bilateral contacts, which are always useful. In this context, I believe we should thank our colleagues, our associates who have worked on the text of the Sochi Declaration and the Comprehensive Plan of Action to Promote Cooperation between Russia and ASEAN for 2016-2020. If there are no objections, I propose adopting both documents. Are there any comments or objections on this matter? No? Let us consider that we are adopting both documents: the Sochi Declaration and the Comprehensive Plan. On my own behalf and on behalf of all of you, colleagues, I would like to thank the ASEAN-Russia Eminent Persons Group for the report on their strategic vision of the future Russia-ASEAN ties. As is known, representatives of the business community, nongovernmental organisations and the scientific community participated in it. I would like to thank you all again for finding the time to come to Russia, for meeting and sharing your opinions about the regional and global situation and discussing our cooperation in the foreseeable future. Allow me to declare our meeting closed. I would like to invite all delegation heads to a working breakfast where we can talk and address current issues in a completely informal environment.